One of the new year's resolutions I have written myself for blogging in 2015 was to cover more base and skin care products. It is more fun to review eye shadows and lipsticks for me but I believe we can all benefit from exchanging thoughts and ideas about skin care. I usually don't stock lot of skin care but try to buy one, use it up and invest in another. I like trying new things unless something is working a magic on my face. 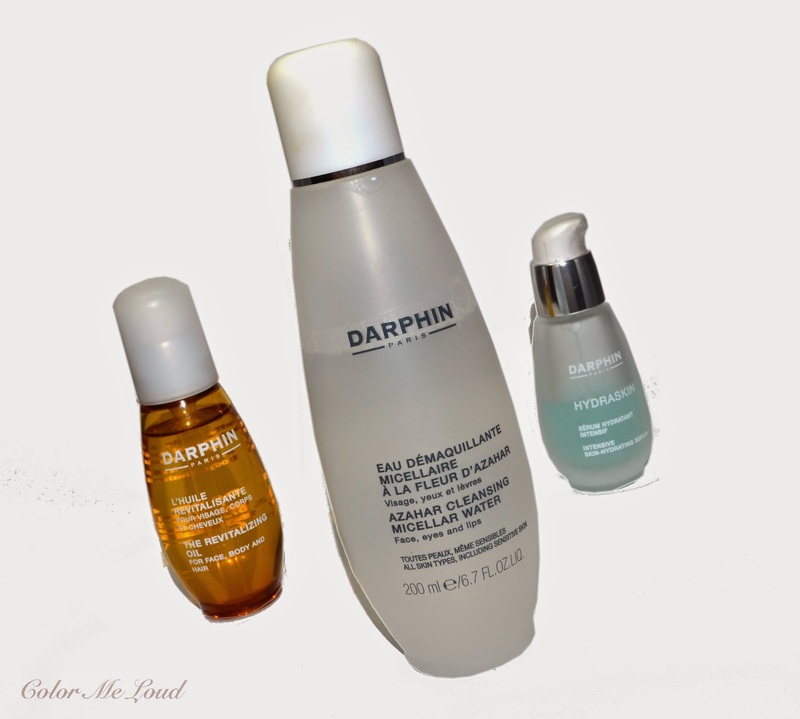 I have acquired some Darphin products over the last months and today I would like to share my thoughts on Azahar Cleansing Micellar Water, Revitalizing Oil and Intensive Skin-Hydrating Serum. 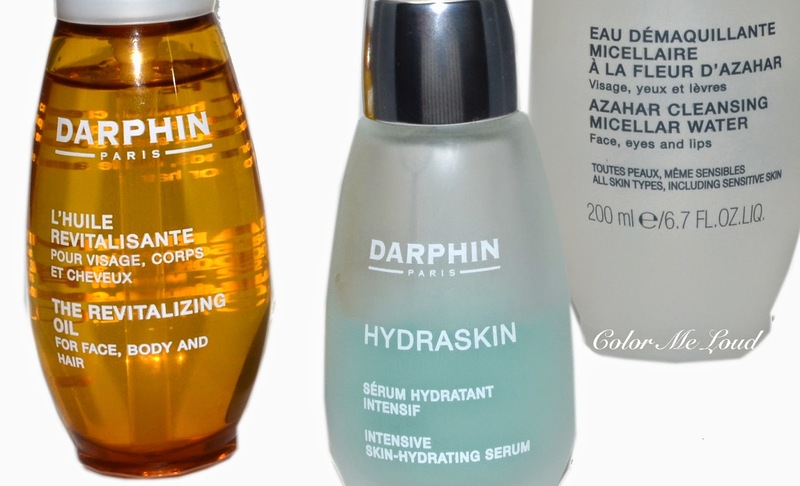 Darphin Intensive Skin-Hydrating Serum was the first product I have tried from the range. It was recommended me by a dermatologist friend to whom I asked how I can keep my face hydrated. She told me to get a serum which has high percentage of hyaluronic acid and gave me its name. I like using two pumps of this on my palm, warm it up by rubbing both hands together and apply it on my face and neck. It has a nice cooling effect and it is absorbed by my skin very fast. Afterwards the skin feels good and not creamy or oily. I can apply it in the morning under my foundation but I usually need a nourishing cream to go with that. If your skin is on the combination to oily side but still dehydrated, you might like it as well since it is oil-free. I have been trying Chanel Le Jour interchangeably with this one under my cream and I found Daphin Intensive Skin-Hydrating Serum to be more hydrating for me. 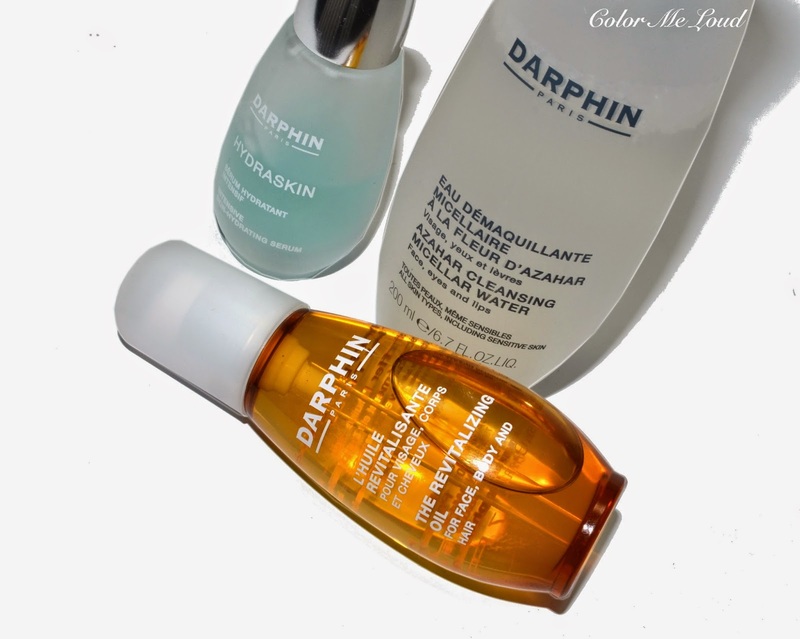 Darphin Revitalizing Oil is an all rounder face, body and hair oil which brings many essential oils together. It has 9 plant oils (argan oil, rose oil, tamanu seed oil, raspberry seed oil, almond seed oil, sun flower seed oil, apricot seed oil, jojoba oil and evening prim rose oil) as well as 4 aromatic oils (ylang ylang, geranium, lavender and rosewood). I got this in the beginning of the winter and found it light weight but still effective. I tried it on the dry patches on my legs, hands and face. Because of the aromatic oils, it has a strong scent, which my husband likes but I am partial to ylang ylang and ended up not being able to use this precious oil a lot because of the scent. It is a personal preference though. If you love aromatic oils and the scents thereof, I recommend you to check Darphin Revitalizing Oil out. Lastly I have tried Darphin Azahar Cleansing Micellar Water. I love Micellar Water and I remove my whole face make-up as well as my eyes using Bioderma Micellar Water for years. Throughout the years I have tried many variants of Bioderma, which would make a whole post by itself but what I would like to write here is that as gentle as micellar water gets, harder it is to remove the eye makeup. Last time during my visit to France, I have gotten some more bottles which surprisingly didn't work to remove the mascara. When I checked it more carefully, I have seen the indicator "very sensitive" on the bottle instead of "sensitive" I used before. If you are wondering how a micellar water works, here is a great "science made easy" post from the lovely blog Musical Houses. Darphin Azahar Cleansing Micellar Water is a more nourishing version of a micellar water which combines the aesthetic oils with micellar water concept. The idea is that while it is removing the makeup from the skin, it feeds the skin by the oils it has in its formula. It is called Azahar because of the Neroli oil it contains from the flowers of Azahar Oranges. Although it doesn't contain any perfume, it has a lovely citrus smells which comes from this oil. The scent is very pleasant. It is also free of alcohol, soap and conservatives. As I used Azahar Cleansing Micellar water, the first thing I have observed is that it is more of a gentle micellar water than a strong one. So if you are using heavy mascara and eye liner, this is not the one you want to go for. It does however work on the base products beautifully and removes everything without making my skin feel dry or dehydrated. I found it to be more hydrating than Bioderma's Hydrabio range which has a bit of a strange creamy feeling once applied. Darphin Azahar Cleansing Micellar Water is more lightweight but hydrating at the same time. Final thoughts: I would recommend Dauphin Intensive Skin-Hydrating Serum if you are searching for a serum with high hyaluronic acid content, especially if your skin is not too dry but still dehydrated. If you like the scent of aromatic oils, Revitalizing Oil is a light weight all rounder for face & body alike. Finally Darphin Azahar Cleansing Micellar Water is great especially to remove the base makeup without making your skin feel dry afterwards. However this gentle effect means it doesn't effectively remove the eye makeup as quick as some other micellar water with more drying effect does. I personally use one of those for my eyes and Azahar for my face. Have you tried anything from Dauphin range? Any recommendations? Disclaimer: I have purchased Intensive Skin-Hydrating Serum myself. Other products were sent for consideration purposes. I love the Darphin Aromatic Cleansing Balm with Rosewood. It's hydrating and cleans your skin super well. I also love the hydra light cream. Great for dehydrated combination skin. Hi Sara, thank you for this nice intro to the Darphin range! I've a few samples lying around, but never got around to trying them! I also share your thoughts about how "gentler" the miceller water is, the less effective it is. But a bottle of my HG miceller water is on its way to you... pls try it and let me know how you feel about it!! I haven't tried anything from Darphin yet. I will have to look up the ingredients. I'm.not loyal to one skincare brand but if I have to name one and the budget is not a problem it would be Omirovicza (with one or two products that are a pass). If budget is an issue- you can (almost) never go wrong with Alverde. Their eye serum wins with £££ products. I only used Darphin's body lotions and don't recommend them - too much silicone and oil and nothing else interesting for skin in the formula, sits on my skin and doesn't soak, ends up on my bed sheets, so is not worth the high price. I did not try any of their face care (except some toner 10 years ago which I remember was pretty useless, more like a scented water) because for my acne-prone skin any oil is tabu and I don't buy into the essential oils' benefits for the skin in general and also in particular after trying an almost entire range of yuli and throwing 7 products a month later in a garbage bin (together with clarins face lotus oil bought before that experiment with yuli). Though, I accept oils in body lotions for nice scent and during winter, as long as scent is not too overwhelming. In this "natural" category I found Korres doing much better body lotions for only a half or even third of Darphin price. Oh now you got me intrigued, thanks so much! Can't wait. About the micellar waters, I can only use not gentle ones on the eyes because the others end up smearing the mascara all around and not being able to remove it. Since I never use water proof mascara I don't want to use oil based cleanser on the eyes. Hi Jen, if you have dehydrated combination skin, you might indeed want to check it out. I believe if you are not a fan of essential oils in general, Darphin range is not suitable for your needs. Although I have dry skin, mine also goes crazy with some of the oils but gladly it didn't do this with the ones I tried from Darphin, including the facial oil. I haven't tried anything from Korres yet, do you recommend their body lotions? Yes, absolutely. Korres body lotions have a great price-quality ratio. There are some stronger and milder scents in their range, but none of them are too heavy or synthetic. There is also one which I think is very mildly scented and also contains more antioxidants & vitamins vs. regular line. It is called After Sun lotion, which I rotate with others versions all year around, not only after really cathcing some sun. Hi Sara, which micellar water would you recommend for the eyes? Thank you.